We believe that early, conservative treatment of gum disease is best whenever possible. A thorough assessment of your gum health is part of our comprehensive new patient examination. Should gum treatment be necessary, a personalized treatment program will be recommended. Gum disease (periodontal disease) is the leading cause of adult tooth loss. It has been estimated that 80% of adults have some stage of gum disease. Patients who have gum disease are at a higher risk of stroke, heart attack, and pregnancy complications. Left untreated, the periodontal disease will continue to destroy tooth-supporting bone and gum tissue. Stages of Gum Disease Treatment of Gum Disease Avoid Surgery! 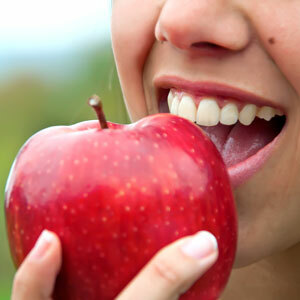 Gum disease is progressive over time and advances in stages. Normal gum tissue is firm, pink colored gum tissue. No bleeding when brushing & flossing. Red gum tissue at the gum line area. Bleeding when brushing & flossing. Red, swollen, bleeding beyond the gum line area. Beginning of tooth-supporting bone loss. Gum tissue peels away from the root forming pockets. Gums badly infected, swollen, bleeding with pus formation. Advancing bone loss with loose teeth. Gums are painful. Continuing bad breath. The treatment of periodontal disease depends on the stage of the disease. Early to moderate gum disease (Stage One and Stage Two above) is normally treated non-surgically. Advanced (Stage Three) gum disease may likely involve gum surgery and possibly loss of teeth. Perio Protect Therapy Program – Periodontal disease is primarily a bacterial infection. Therefore, it is important to treat the disease at its source – in the gum pockets, where the pathologic bacteria thrive. The Perio-Protect program uses custom-made appliances made for your mouth to deliver the medications into the pocket areas.The primary benefit of the Perio Protect therapy program is that it is extremely effective, and is the method of choice for mild to moderate periodontal disease. Low-Level Laser Therapy – In order for the gum tissue to heal properly, it is necessary to eliminate the infected tissue lining the gum pockets. This will allow the tissue to reattach to the roots surfaces of the teeth so that the pockets can heal, decreasing the depth of the pockets. In the past, gum surgery was the only option available for removal of the infected tissue lining the gum pockets. Once the gum pockets are healed, cleaning the pocket areas then becomes easier and more efficient–both in the dental office and at home. The combined use of these two latest technologies has been shown to be more effective in eliminating and controlling the harmful bacteria that cause gum disease infection. The removal of plaque and tartar also becomes easier during treatment. The use of Low-Level Laser Therapy and the application of effective localized medications available through the Perio-Protect Therapy Program® is a winning combination. In many cases, gum surgery can be avoided. The Perio-Protect Therapy Program is an innovative new method for the treatment of periodontal disease (also known as gingivitis, periodontitis, or gum disease) using an FDA-approved system. The Perio-Protect Therapy Program for the treatment of periodontal disease features easy to use, very comfortable, clear, and flexible appliances worn over your teeth and gums for just minutes a day at home or at work. The appliances are used to supply the medications prescribed by the dentist directly to the source of the gum infection in the infected gum pockets, in order to help heal your gums and restore your oral health. Unlike conventional periodontal surgery, the Perio-Protect Therapy Program® involves less loss of time from work and costs less than gum surgery. The best news of all – it is very effective. This method of treatment is most effective for mild to moderate periodontal disease. Low-level diode laser therapy is one of the most advanced technologies available for the treatment of periodontal disease. In conjunction with micro-ultrasonic instruments to remove biofilm and tartar, the laser enables the elimination of the infected tissue that lines the gum pocket without harming any healthy tissue-lining areas. In most cases, the procedure is painless or requires only the application of a long-acting topical numbing agent (no needle). Worried About The Health Of Your Gums? Call (760) 746-2559 today and to schedule an appointment.